With the timber frame structure installed for this new home, the external finishes can be undertaken. 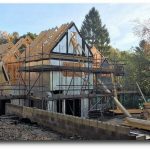 Our previous blog article showed that the roof was felt and battened two days after the completion of the timber frame roof structure. Also, the cladding and windows had been installed to weatherproof the structure so that internal trades could get on with their works without any delays due to bad weather conditions. You can see in the below time-lapse video the roof is tiled and the external face of the timber frame walls have been insulated with Actis Boost’R then battened in preparation for the external cladding to the first floor. The photos below show the battening and cladding process in closer detail. Once the cladding has been fitted and all roof works complete, the scaffolding can be removed and the internal works progressed. For this timber frame closed panel home we have insulated the internal walls with an acoustic insulation (including Fermacell Board to both sides) as well as the floor joists also being insulated with 100mm acoustic insulation. Below are some photos of the home as it is now with just the front door to be decided on by the clients. The video below shows the time lapse of the installation of the cladding which was completed to the front projection within a matter of days bringing the home to life. With an attic truss roof design, this has offered the property a considerable amount of loft space which the clients will use for additional accommodation for their family and their young children as well as a playroom/den. As the internal finishes are completed we will post more photos of this fabulous new timber frame home in Cold Ash, Berkshire. If you wish to speak to us more about this particular project, or if you have a project of your own design that you would like us to look at, please email us directly at info@vision-dsl.com or call us on 0118 971 2181.